El sueño del gran árbol y los objetos improbables l The Dream of the Grand Tree and the Improbable Objects at GE Galeria in Mexico. 2018. For more information on "Under The Same Sky"
Una exposición sobre el turismo desde una mirada crítica. 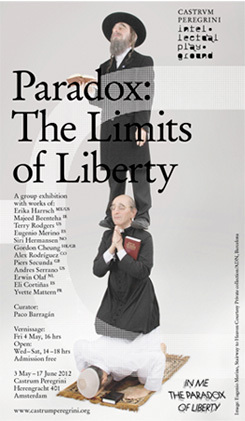 Ariadna Ramonetti, Alonso Cedillo, Cristóbal Gracia, Débora Delmar, Diego Glazer, Eduardo Abaroa, Erika Harrsch, Hugo Leautaud, Jacobo Zambrano, José Eduardo Barajas, José Luis Cuevas, Juan Caloca, Julio Castillo, Madeleine Jiménez, Marco Aviña, Melquiades Herrera, Marek Wolfryd, Oswaldo Ruiz, Paloma Contreras, Pilar Villela, Ramiro Chaves. Curaduría: Wendy Cabrera Rubio y Karla Kaplun. Es innegable. Ningún lugar está libre de la mirada turística. El espacio cambia y se re-configura a favor del espectáculo. Los habitantes del pueblo se esfuerzan por continuar vendiendo a los nuevos viajeros su identidad digerida. Paradójicamente, la búsqueda perpetua del “carácter” de lo “auténtico” y lo “original” ha resultado en la sistematización del viaje turístico. "Migration ist das natürlichste auf der Welt - und Kunst kann uns helfen, das zu verstehen"
"Migration, is a naturally occurring process and art is a means to help understand it." E.H.
PANEL - "Accessibility and monetization of moving image art now and in the future. New platforms and new solutions." Friday December 1, 2017 - 10-11 Uhr // 10:00-11:00AM PLACE: Congress 2 Raum: N242W, Festivalzentrum: Junghofstraße 5-9, 60311,Frankfurt. PLACE: Congress 2 Raum:N242W, Festivalzentrum: Junghofstraße 5-9, 60311,Frankfurt. Under the Same Sky … We Dream is a video and sound installation by artist Erika Harrsch in collaboration with singer Magos Herrera. 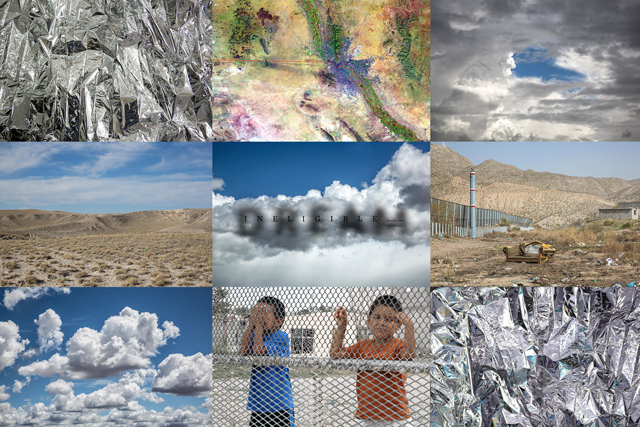 Harrsch has a history of creating interdisciplinary and participatory projects that explore the topic of immigration, particularly between Mexico and the United States. Under the Same Sky focuses on children who cross borders, both with and without their families, and highlights the conditions of immigrant minors both at the border and within the United States. 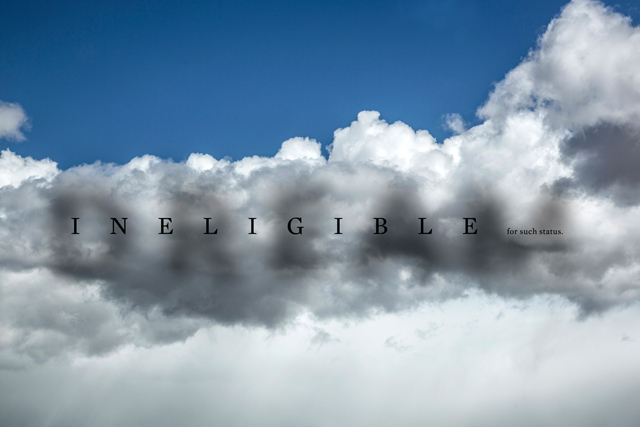 At the center of the piece is an oversized screen showing a double-sided time-lapse video of the sky filmed between El Paso TX and Ciudad Juarez, Chihuahua. Beyond the screen visitors encounter dozens of thin green plastic sleeping pads with silver emergency mylar thermic blankets such as those used in temporary detention centers for unaccompanied minors dotted along the US-Mexico Border. 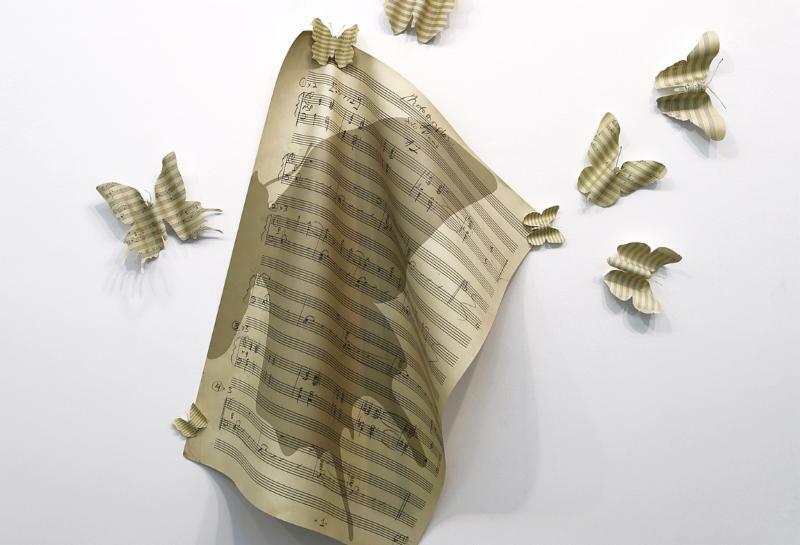 The installation is accompanied by a soundtrack with phrases extracted directly from the DREAM Act of 2011 sung by internationally acclaimed Mexican singer Magos Herrera. Under the same sky... we dream, reflects on the rights to move freely beyond borders and the consequences of unregulated migration, the detention centers for undocumented minors at the border of Mexico and the USA and the Dream-Act legislation of the immigration reform in the United States, that was never adopted. The installation is a multi-sensory perspective on the loaded realities at the border and the immigration conundrum as a space for reflection, participation and active creation. The border undergoing constant construction and revision, transforming upon geopolitical interests and national structures. 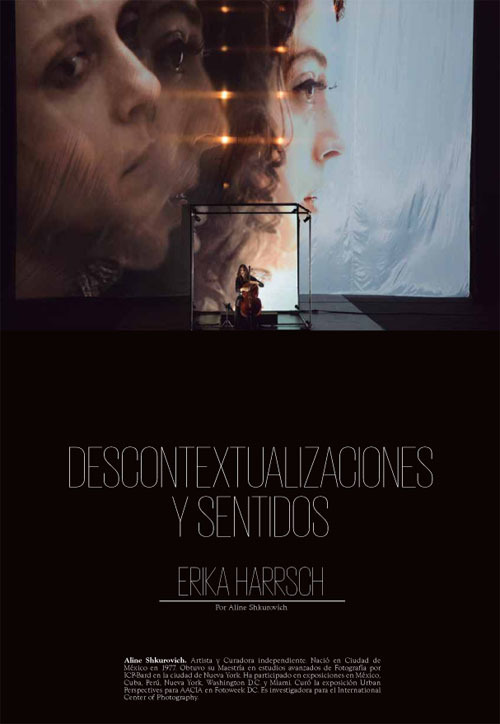 GE Galería is pleased to invite you to the book presentation of NY based, Mexican artist Erika Harrsch. The book includes texts and images that document the wide and international trajectory of the artist; Bilingual publication (English and Spanish) by the General Direction of Publications of Secretaria de Cultura (CONACULTA) and The Nevada Museum of Art. 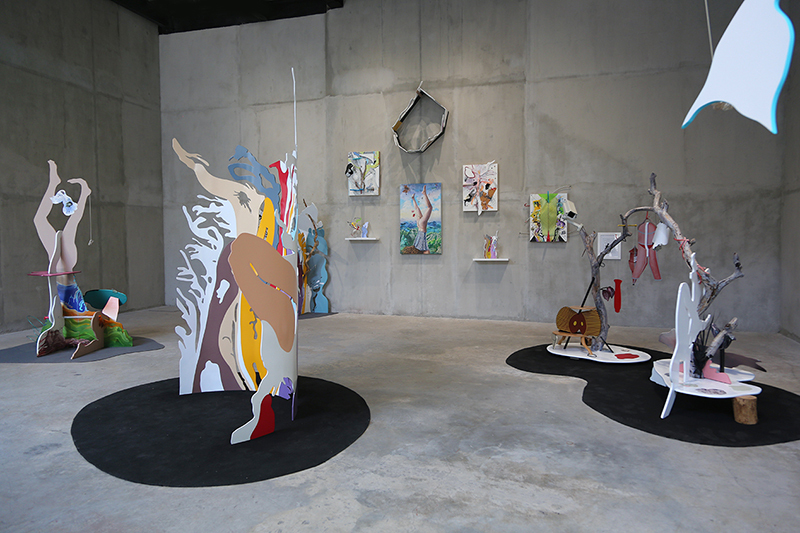 Erika will be in conversation with Irving Domínguez, Mexico City based, curator and art critic. Join us for an open forum and book signing on Thursday, May 25th from 8:00 - 10:00 pm at GE Galería San Pedro. We will also present a preview of the artist’s solo show in February 2018. 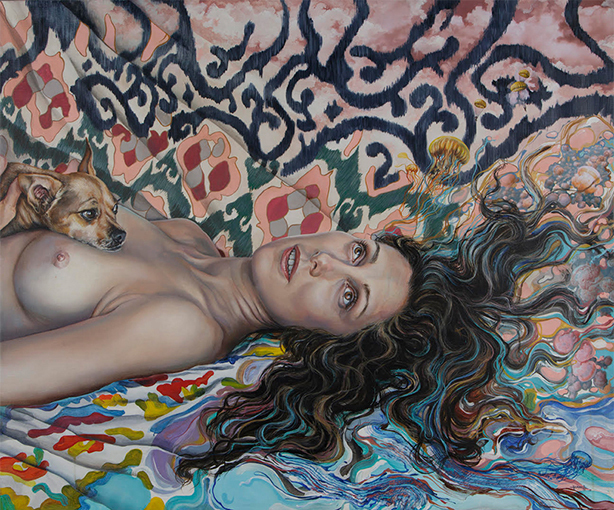 Erika Harrsch from Mexico and New York, in the current exhibit at HVCCA, “Between I & Thou,” draws upon old master paintings to bring sharp focus on her vivid portraits. Between I & Thou includes artists from around the globe, exploring interconnections between the personal, cultural, religious and national. The works reflect the human need to tell the story of self and society, offering a rich conversation about the sameness and differentness among us. There is an emphasis on the inclusion of senior artists whose works cogently reflect lives lived across significant changes in history. 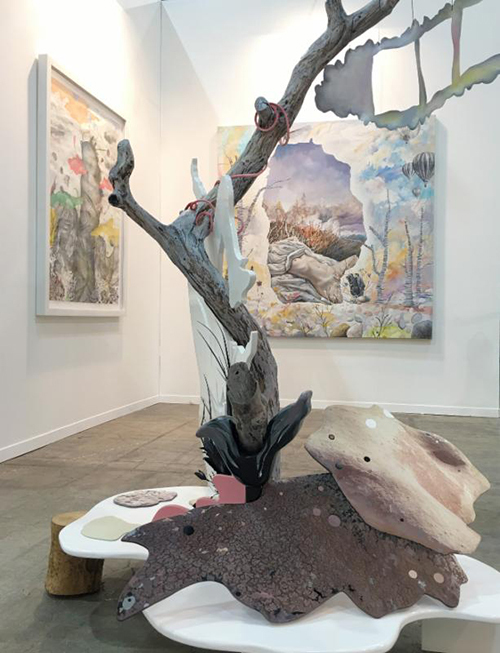 Artists: Cristina Arnold, Laura Battle, Peter Bynum, Orly Cogan, Leonardo Drew, Camille Eskell, Christian Guðmundsson, Erika Harrsch, Meg Hitchcock, Chris Jones, Barbara Korman, Cal Lane, Katherine Mangiardi, Todd Murphy, Brigitte NaHoN, Susan Obrant, Jong Oh, Margaret Loy Pula, Liz Quisgard, Raquel Rabinovich, Asya Reznikov, Faith Ringgold, Aminah Robinson (Aminah Brenda Lynn Robinson), Antonio Santin, Yardena Donig Youner, Jayoung Yoon, Judith Zabar. 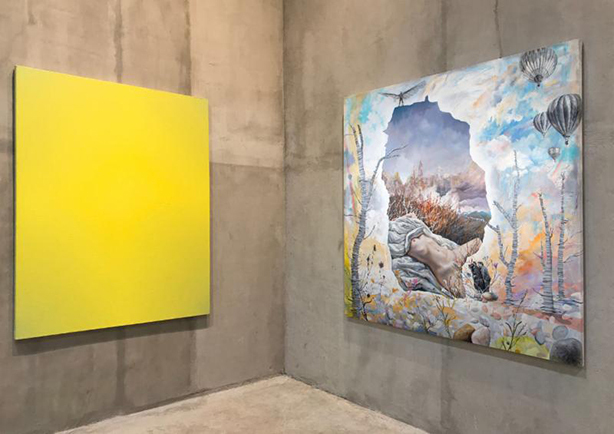 MARC STRAUS is proud to present The Incredible Likeness of Being, a group exhibition that investigates the ‘Self’ through new paintings by five international contemporary artists. 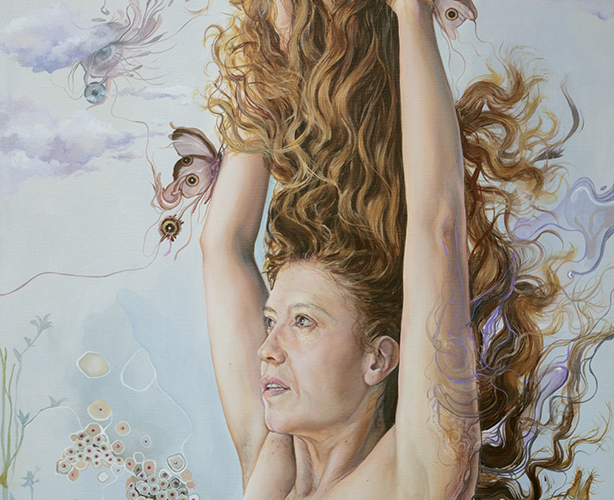 In Erika Harrsch's ensemble of mixed-media paintings, she explores issues of identity through her different cultural lenses, depicting the (her) female body connected to elements of animal anatomy, both mammals or insects, with eroticized sketches and a diversity of media associated with opulence and sensuality. 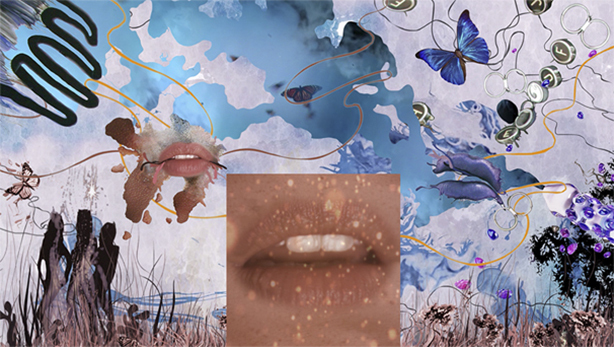 New York-based, and Mexican-born artist and self-taught lepidopterist Erika Harrsch has created a video and sound installation titled Eros-Thanatos, a participatory recreation of the Monarch Sanctuary in Michoacan Mexico. 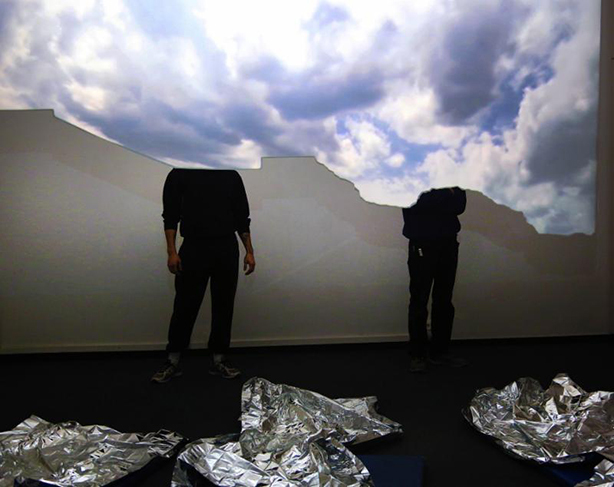 To complement the installation, Harrsch will have pop-up performances of United States of North America. In an interactive installation, visitors fill out faux paperwork and spin a "wheel of fortune" to see if they can win a passport for "North America"—an imaginary country that combines features of Canada, the USA, and México. 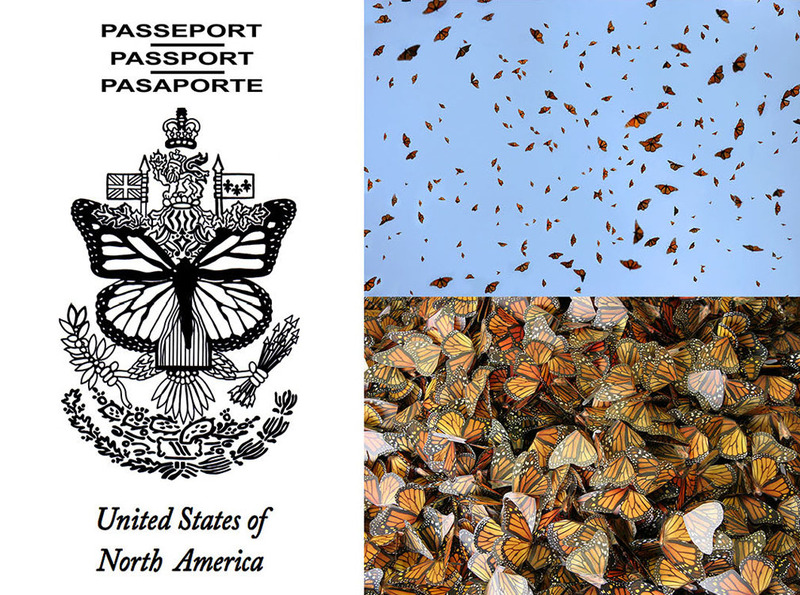 The passport combines features of all three countries, and at the center is an emblematic representation of the Monarch Butterfly, which belongs to the three nations—crossing freely without borders. PUBLIC PERFORMANCES AND LECTURES: Friday April 17, 2015 / 12 – 12:45 pm Artist Erika Harrsch discusses the intersections between art and public engagement in her work on display in the museum and the pop-up art performances happening throughout the community./ Art Bite, Friday, April 17 (Erika Harrsch lecture in the auditorium and museum opening). / May 1st and 3rd (United States of North America Passport Office Performance on the public space, Streets to be announced). / May 7th and May 9th (United States of North America Passport Office Performance, inside of the Museum). / June 13 (Currency Kite Performance at the Museum outdoor space). "…The cello, played well, is a soulful instrument. So human, so organic. The last thing you'd think a cello needs is high-tech enhancement. And yet, several years ago the visual artist Erika Harrsch began collaborating with cellist Maya Beiser and composer Paola Prestini on a new work. Harrsch had an idea: What about an LED cello? An instrument covered with panels of light-emitting diodes. Harrsch says at first, it was a tough sell…." The University of Nevada, Reno awarded Erika Harrsch as the SOTA Series Artists-in-Residence and appointed as Guest Faculty to co-teach Art in Public Places, incorporating the first multi-disciplinary-collaborative program with Professor Joseph DeLappe. During the Spring 2014 semester Erika Harrsch lead the Visiting Artist MFA in Studio and the Interdisciplinary Grad Students program. 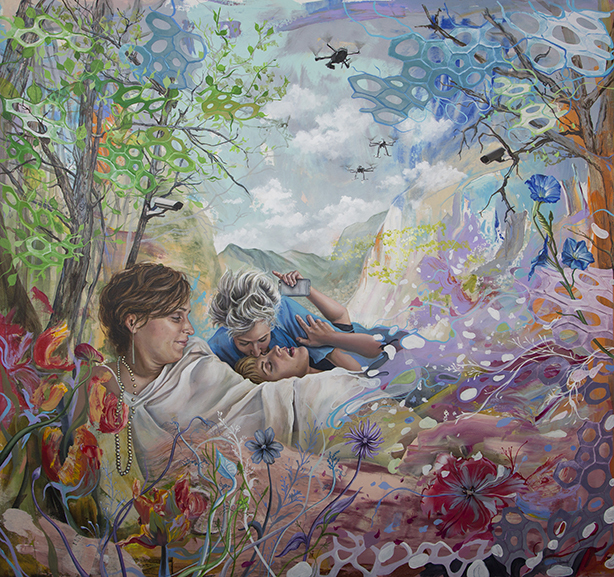 New York artist Erika Harrsch’s multimedia work reflects her life experiences by connecting, art, science, technology and social studies into interactive and poetic experiences, which expand the meaning of art itself. She began her journey as a painter and stretched the scope of her practice by experimenting with photography, video, animation and interactive installations. 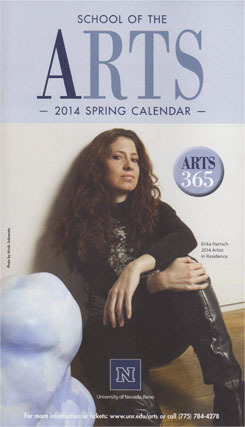 Featuring cellist Jeffrey Zeiger, composer Paola Prestini and artist Erika Harrsch. 7:30 p.m. n April 8 Nightingale Concert Hall, Church Fine Arts, University of Nevada Reno. Room35-Labyrinth premiered February 1st 2014 at the Krannert Center. 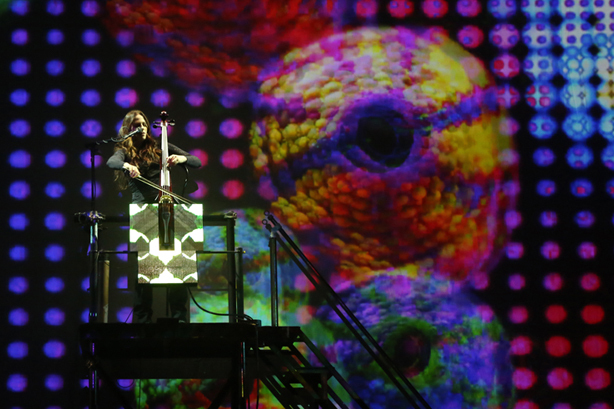 An interdisciplinary installation concerto for cellist Maya Beiser composed by Paola Prestini and visuals by Erika Harrsch. Stage director Michael McQuilken, Brad Peterson video designer and Yi Zhao lighting designer. 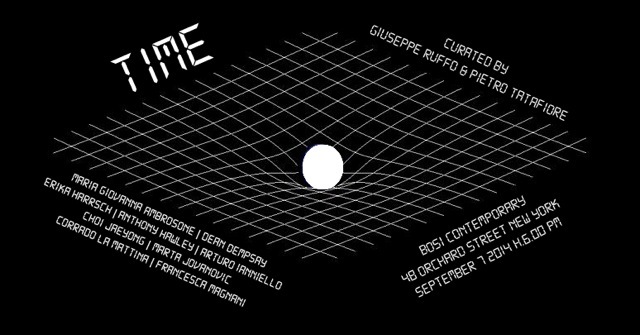 A collaborative venture that tightly incorporated sound, lighting design, and projected visuals. The Krannert Center performance featured the ©Erika Harrsch-LEDCello in collaboration with Meric Adriansen froom D3Led, eDream institue and Jason Price animation. 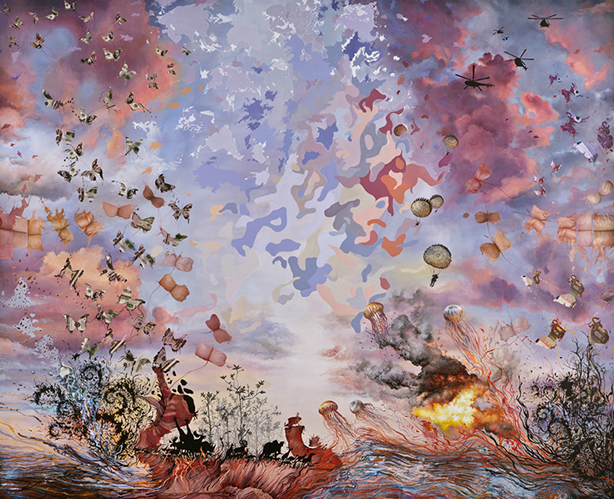 A Beth Morrison Projects work commissioned by VisionIntoArt and the Krannert Center. Supported by the National Endowment for the Arts. Featuring Erika Harrsch " United of North America passport performance"
Room 35 is a multilevel artistic expression within a musical performance. 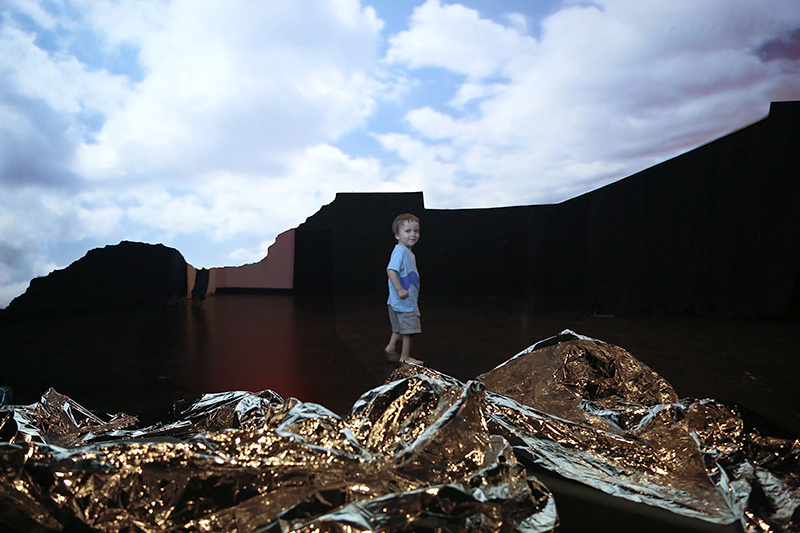 A multidisciplinary collage on stage with performance, music, video, animation, moving images and sculptural elements designed and created by Erika Harrsch. Room No. 35 maps the labyrinth of the heart and seeks to unify the tangential impulses of the human spirit, a surrealist story about a person attempting to escape from a dream in which she meets four other versions of herself. The stage includes various sculptural elements, including the @Erika Harrsch LEDCello, incorporating sound, lighting design and projected visuals. 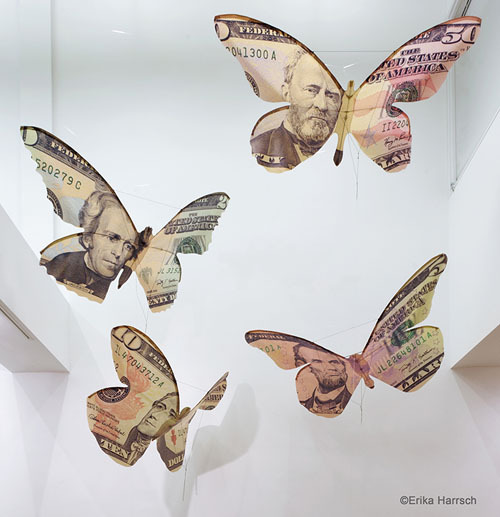 I created a work in which banknotes shaped as butterflies circulate in patterns that represent a vital connective system— Specimen-prints of currency from many countries will mimic the delicate beauty of butterflies in migratory flight, reflecting the transformative power of global mobility. After years of observing Monarch butterflies closely, often photographing and filming at the sanctuaries in Mexico, I have come to be in awe of their collective flight. 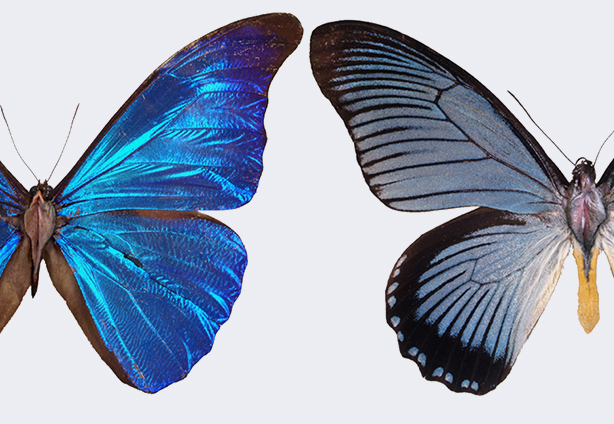 The balanced perfection of its flow is fascinating, as is and the subtle correlation between light and the direction of the butterflies' shifting patterns. The Monarch butterfly, during its fall migration, navigates over long distances using a time-compensated sun compass. Apparent fragility turns into energy and strength, as the winged creatures travel three thousand kilometers on their annual route, sometimes taking advantage of wind currents to glide. For that reason, I base the installation designs on real wind vectors, evoking the motion of air masses around the globe. The circular patterns, waves and perspective lines of the designs represent the release of energy from a hidden source and its distribution through dynamic connective patterns—a constant flow that continues through the whole life cycle. Erika Harrsch awarded with the Gaea Foundation-Sea Change Residency, July 2012"
The Gaea Foundation supports the discovery and realization of alternative social realities that are just, creative, sustainable, and authentically democratic. Aiming to bring these values to public awareness, Gaea provides the time, space, and funds through Sea Change Residencies. Outstanding activists, cultural organizers and educators, multidisciplinary visual artists, performers, writers and new media artists, academics and scholars, who are making critical headway in engaging the public with alternative social action are recognized. Copyright ©Erika Harrsch. All Right Reserved.